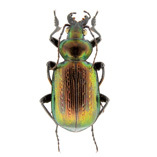 The species of the subgenus Castrida belong to the Calosoma that have the ligula of the endophallus sclerified ("Calosomes ongulés" sensu Jeannel, 1940). According to Jeannel (1940), that dealt with Castrida as a distinct genus, it refers to the phyletic line Castrida-Caminara, that he considers originated from the ancient Afro-Brazilian plateau, In this phyletic line, in most cases, a basal seta is still present close to hind angles of the pronotum. Castrida, in comparison with other subgenera of the same phyletic line, is characterized by the metaepisternum with only few major punctures. The mesotibiae are usually arcuated, most conspicuously those of males. 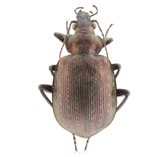 In all the species, with the exception of Calosoma (Castrida) rufipenne, on the internal side of the apex of male's mesotibia is present an oval tuft of red hair, prolonged into a kind of apophyses. But we have to take in mind that the morphological characteristics that identify the subgenus have to be taken jointly. 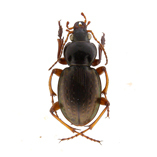 For example, the punctures of metaepisternum are not always so evident and most of the species have a seta close to hind angles of the pronotum, but there are a few species without seta, and some other species where this characteristic varies in each individual. Some species of this subgenus are variously differenciated for adaptation to specific conditions of habitat and were accordingly included in different genus or subgenus that are here considered superfluous on the base of considerations that will be presented when dealing with the concerned species. 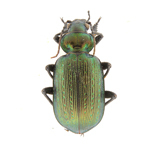 The subgenus Castrida includes fifteen species widespread throughout south and central America, penetrating to the north up to the eastern United States.